As the webmaster of a website, your aim should always be to get more traffic or visitors and retain those visitors. And, a site visitor is less likely to only stay on your website and check out all that it has to offer, if the pages load at a snail’s pace. Any delays experienced in the page loading could make the visitors close your website and search for an alternate option in search engines. So, you might say that your website’s performance and speed is as critical as its content. So, webpage load times are reduced by using a CDN, as it uses the server closest to your visitor’s location. In a way, the CDN provider ensures the appropriate caching of your content for quick delivery over the network of servers to any location across the globe. All this is aimed at making your website very fast to navigate. This is why the selection of an ideal CDN provider is very important. You may find plenty of in-depth reviews about the best web hosting companies for your website. And, some web hosting companies also use a CDN. However, there are very limited sources that offer access to details about the CDN providers. Hence, you need to research a lot and, more importantly, know what features to look for in your CDN service provider. Two of the most popular CDN providers are CloudFlare and MaxCDN and both have a positive impact on the speed and performance of your website. However, depending on the type of your website and business, you may find one of them more suitable based on your requirements. This article is thus aimed at providing a detailed comparison of CloudFlare and MaxCDN in terms of their features, pros, cons, and plans and pricing. Both CloudFlare and MaxCDN are based in the USA and were founded in 2009. CloudFlare’s headquarters is located in San Francisco, California, along with offices situated in Singapore and London, MaxCDN’s headquarters is located in Los Angeles, California. While CloudFlare has already served more than 2 million websites, MaxCDN has done the same for more than 6 million sites. And, while MaxCDN focuses more on the quality of speed improvement and performance betterment of your site, CloudFlare enhances both your site’s security and speed. MaxCDN also offers active support for open-source software and is a funding partner of Nginx. It furthermore supports Google’s SPDY and hosts jQuery as well as BootstrapCDN on its network. CloudFlare uses a modified version of Nginx as one of its key technologies. Let us now understand the peculiar features and services offered by these two top CDN providers. To set MaxCDN up, you do not need to modify the DNS name server settings. It is not as easy to set up as CloudFlare, but that is why it can be used by Content Management Systems (CMSs), such as WordPress, Vbulletin and Joomla. If you are already using the W3 Total Cache plugin, then half of the MaxCDN settings are already done at your end. You just need to enable your MaxCDN account by using a button which is available in that integrated plugin. Regardless of your website platform, you can set up CloudFlare in minutes. For this purpose, all you have to do is change the DNS name servers of the domain at the domain central of your host. This is a very easy step that does not require you to change any existing code or install any software or hardware. Alternatively, you may even use the dedicated setup application in cPanel, if available, to set up CloudFlare. And, if you are unhappy with CloudFlare’s services, it is as easy to turn it off as it is to set it up. MaxCDN has around 57 data centres, 31 of which are in Europe, 22 in North America, three in Asia and one in Australia. It does not currently have any data centres in South America or Africa, though there are plans to set one up in Brazil. These data centres use fast-paced SSD servers, with 10GB connections. And, to establish quick mobile connections, MaxCDN has tie-ups with different internet service providers. CloudFlare has fewer data centres (only about 31) than MaxCDN, but they are well distributed across most continents. (They do not have data centres in Antarctica.) The best part is that CloudFlare has a specific website to provide updated notifications for the performance of every data centre. And, all your website traffic is likely to go through the entire network of CloudFlare data centres. MaxCDN’s support is quite comprehensive, as it allows you to contact them via telephone, chat or email. In fact, you can even connect with them via their social media pages. Once you have raised a ticket with them, the average response time per ticket is around five minutes, which is extremely good. Also, you can use the MaxCDN documentation which includes getting started guides, FAQs, developer resources and tutorials. CloudFlare’s support is not as comprehensive as MaxCDN, but it does the job. It offers an extensive knowledgebase for issues, help and guidance on all topics, such as getting started, billing, caching and analytics. It also enables you to search for your queries through their search bar and, if you are unable to find an answer, you can submit a support ticket. MaxCDN possesses an intelligent network of servers that enables fast loading of your webpage from a server that is nearest to your site’s visitor. This helps to optimise the speed of your website. Also, it empowers your site with instant purge and provisioning which ensure your new origin deployments are seen immediately. Moreover, MaxCDN supports total automation of their CDN through their complete integration of API and GitHub. Push zones – larger files that rarely change, such as eBooks, zip files and PDF files, are available in these zones as they are till you change or delete them. Vod zones – video and audio streaming files in these zones are served using the Real Time Media Flow Protocol and remain as they are till you change or delete them. MaxCDN offers access to real-time reporting and analytics. Through the reports that are generated, you can easily check the file sizes, top 50 files, data centres from which files are being called, zone breakdowns, status codes and more. Such real-time reporting gives you access to details about the files being viewed, the location of such views and the resources that consume your bandwidth. MaxCDN also offers some security features, even though these features are not as comprehensive as those offered by CloudFlare. It makes it possible for you to use a two-step authentication process (secure tokens) for your account protection and you can even implement IP address whitelisting to keep track of people who are allowed to access your account. Additional security is offered for applications, such as OAuth authorisation, HTTP Referrer Whitelist and Secure Tokens. It also enables instant one-click SSL activation for enhanced security. Similar optimisation features include gzipping pages, asynchronous resource loading, minification and browser caching. CloudFlare provides a detailed report of your website’s traffic through its analytics page. This report can be available on a site-to-site basis or on a consolidated basis for all free plan websites or even all paid plan websites. These reports reveal information about regular site traffic, total page views, crawlers, bots and threats. It also includes finer details, including the country of origin of threats and search engines that have crawled your site. CloudFlare offers protection to your website against DDoS attacks, malicious bots, SQL injections, comment spam and more. And, for online threat protection, CloudFlare uses Website Application Firewall (WAF). With the change in DNS settings for CloudFlare setup, its server acts as a proxy between your site’s server and its users, ensuring a secured protection layer. The comprehensive security features of CloudFlare enabled it to deal with one of the largest DDoS attacks in internet history in 2014. Thus, it was evident that it can easily handle large-scale website attacks. Below is a comparison of the different plans offered by MaxCDN and CloudFlare for your website. 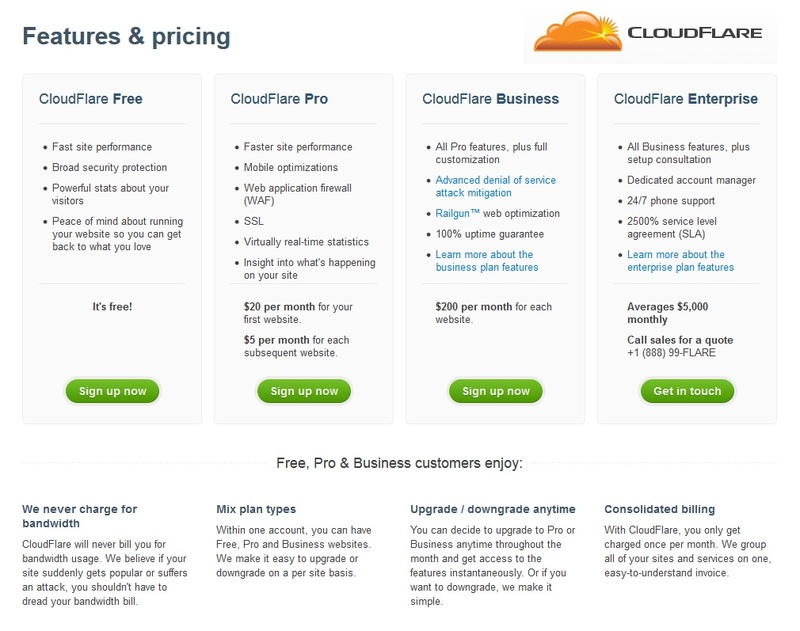 CloudFlare offers four different plans (Free, Pro, Business and Enterprise). You can always upgrade or downgrade between the Free, Pro and Business plans. Also, it does not charge you for bandwidth usage for these three plans. So, you need not worry about your site’s traffic increasing all of a sudden, as the increased bandwidth used will not result in any charges. And, for all your websites and services consumed (under the Free, Pro and Business plans), you get a single consolidated invoice from CloudFlare. Plan 4 – 5TB bandwidth per month for seven websites (zones) at $299.00 per month (5.5¢ for every GB used excessively). And, for the enterprise custom plans, you can get in touch with the MaxCDN team with your requirements and design a plan to suit your website. Below is a comparison of the features offered under these types of MaxCDN plans. Unlike CloudFlare which only offers ticket or mail support, MaxCDN offers around the clock support and various support options, such as chat, email and phone. Unlike CloudFlare, every page of your website is cached by MaxCDN and a cached version of your site is displayed in case of a downtime. Unlike CloudFlare, the MaxCDN reports enable you to learn the downloaded files and their source. Its RESTFUL API enables interaction with applications and third-party platforms. It does not implement the CAPTCHA feature, which is often a frustrating feature for the users of CloudFlare. It offers a 30-days money back guarantee period, which is more than enough to test all its CDN features. It offers protection against DDoS attacks and SQL injections, which MaxCDN may not be able to do. Unlike MaxCDN, you can use certain CloudFlare features for free, with its free plan. Unlike MaxCDN, it does not place any restrictions or limits on the usage of bandwidth by your website. All your website’s traffic has to go through CloudFlare’s network (due to you pointing your domain DNS name servers to theirs), which makes it extremely difficult for potential attackers to attack your server directly. It is extremely easy to set up or implement, using the step-by-step instructions, and does not require any research, unlike MaxCDN, which may take some time to set up, especially if you do not already have the W3 Total Cache plugin integration. Both MaxCDN and CloudFlare offer high speed and optimal performance for your websites. However, we prefer MaxCDN due to its better caching ability and comprehensive support options. MaxCDN is suitable for enterprise sites or large traffic sites, for which performance optimisation is of the utmost importance. For enhanced security, CloudFlare is the better CDN alternative, due to its vast range of security features. Also, if you do not need additional security or do not want to irritate legitimate users with additional security measures, for example CAPTCHA, then MaxCDN may be a better CDN provider. If you have used MaxCDN or CloudFlare as your website’s CDN provider, please feel free to share your experiences in the comments section below. Good comparison points between MaxCDN and CloudFlare. Both the CDN’s provide different services yet they both enable the website to load faster. With less traffic CloudFlare free plan is right for most people. Once the traffic is increased, MaxCDN is the best service provider. For professional businesses Akamai is the real deal.